Kim, RECE was hired as a supply with Sundowners on July 15, 2013 and has been a permanent employee for the last 5 years. Kim’s commitment to early learning stands out in all aspects of her day and is reflected in the programs that she provides for all children. 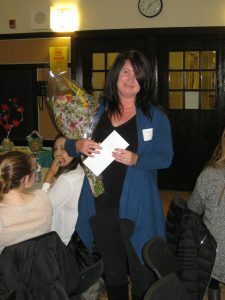 Kim primarily works with the school age children at Holy Cross, but also spends part of her day in the preschool room. She is warm and welcoming to each child. Kim actively listens to the children in her care and together with her observations she provides a fun but challenging program that teaches the children new skills and techniques. Over the past year Kim has introduced the children to knitting, needle point, science experiences, cooking, wood working and lots of team building activities. Kim spends her own time searching and preparing activities, games and crafts. This past summer was so hot, Kim decided to build a care wash for the children to ride the bikes through. We can thank Kim’s love of Pinterest. This care wash sparked lots of imaginary play and it helped keep everyone cool, including the teachers. During the previous school year, Kim prepared birdhouse kits for each child in her group. Kim and her husband collected scrap wood, which they precut and drilled for the children to assemble and paint. Each child took home a personalized bird house to put in their yard. Kim takes great pride in her work and no task is either too small or too big for her attention. She enhances the Sundowners organization with her amazing documentation. She provides a good example of interactive documentation that paints a picture from beginning to end. Kim provides positive and interesting feedback to parents regarding their children, projects, play and daily activities. She makes the program fun and engaging. The children are always excited to see what the plan is for the day. Kim provides the opportunity for children to make choices, decisions and to think outside the box. Kim leads by example, she puts her heart and soul into her work with the children and ensures that children feel engaged and can express themselves. Kim sets high standards for the program and mentors new staff and ECE students to do the same.